A depiction of the AFM tip and surface molecules. Image courtesy of Hebrew University. A team from the Lawrence Berkeley National Laboratory in the US and the Hebrew University of Jerusalem in Israel has shown that structural defects and jagged surfaces at the edge of platinum and gold particles at the nanoscale are key hot spots for chemical reactivity. Using a broad spectrum of infrared light with an atomic force microscope, they confirmed that such defects at the periphery are central to catalyst function, a breakthrough that could lead to the customization of the structural properties of catalysts to make them more effective in producing chemical reactions. Catalysts can improve the rate of chemical reactions and allow them to be more efficient while staying unchanged in the process, and are involved in the manufacture of a range of industrial products, including fuel, fertilizers and plastics. This study, reported in Nature [Wu et al. Nature (2017) DOI: 10.1038/nature20795], used a new spectroscopic approach to detect chemical processes at a nanoscale resolution, increasing our knowledge of how the atomic structure of nanoparticles impacts their function as catalysts in chemical reactions. Being aware of the exact level of energy that's required to trigger chemical reactions is key to optimizing reactions – as co-leader Elad Gross states, “This technique has the ability to tell you not only where and when a reaction occurred, but also to determine the activation energy for the reaction at different sites”. The technique showed that areas on metallic particles of about 100 nanometers are most active in chemical reactions, with different levels of chemical reactivity at the edges of single platinum and gold nanoparticles compared to their smooth, flat surfaces. Researchers coated the metallic particles with a layer of reactive molecules and focused the infrared light onto the tip of the atomic force microscope. 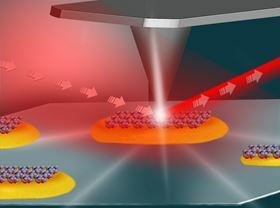 The tip, when combined with the infrared light, acted as a very sensitive antenna to map the surface structure of individual nanoparticles while also showing their detailed surface chemistry. Co-leader F. Dean Toste said, “we can now directly identify the important role of surface defects in activating industrially relevant catalytic processes”. The IR nano spectroscopy technique could prove an important tool for studying surface-related chemical processes at the nanoscale, and offer new awareness of chemical processes on the surface of batteries, coatings and fuel cells. Using the same technique, the team now hopes to explore active chemical processes that use controlled flows of gases or liquids to trigger reactions, and are looking to use a new infrared beamline to increase the capacity and capabilities for infrared-based 3D structural studies.